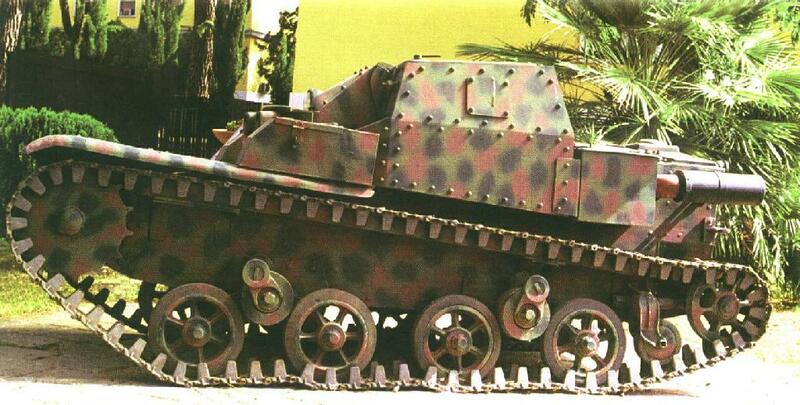 The Carro Veloce L3/38 tankette was an improved version of the L3/35. It was fitted with twin 8 mm Breda 38 machine guns. The suspension system was changed to give a faster and smoother ride. It now had two independent bogies, each with bigger spoked road wheels and sprung by a torsion bar. The propulsion unit was replaced with a slightly more powerful FIAT 122AC/B 6-cylinder 42/46 hp engine. Carro Veloce which means fast tank. The letter L is for light tank followed by the weight and the year. It had a top road speed of 45 km/h (27.9 mph), 5 km faster than the L3/35. Most WW1 tanks could not drive faster than 14 km/h. 200 were ordered but only 84 were delivered. Just like the L3/35 tankette it had bolted not riveted armour, increased armour thickness at the front up to 15 mm and improved vison over the earlier L3/33. A number of earlier L3/33 adn L3/35 tankettes were retrofitted to the L3/38 standard. FIAT obtained the licence to produce copies of the British Carden-Loyd tankette in 1929. 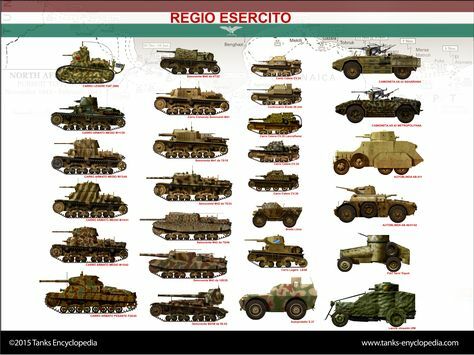 When Italy joined World War Two in June 1940 the L3/35 (CV-35) tankette along with the L3/33 (CV-35) were the most numerous armoured fighting vehicles in the Italian Army. The L3/38 saw service in in Italy and Sicily. It was not sent to North Africa. They were involved in fighting the Allies in 1944 in Southern Italy. When the Italian Government surrendered they were taken over by the German Army and reused as for internal security patrols by the Italian Fascist Republican National Guard GNR who continued to fight for the Nazis or by the German Gebirgsjägers light infantry mountain units. According to their 1930s program of renovation and strengthening of the armored forces, a Brazilian military mission was to select the most appropriate model to be bought from Europe. The CV-38 were selected and 23 were purchased in 1938, 17 of which were armed with a 7.7 mm (0.3 in) machine gun each, three with 13.2 mm (0.52 in) Breda HMGs and three were unarmed command vehicles. They were designated as support machine-gun tanks (Autometralhadoras). According to other sources, 23 CV-35s were purchased for the tank school, although referred as “Auto Metralhadoras de Reconhecimento” (AMR), and divided between four platoons of five tankettes each (and three in reserve). These were equipped with twin Madsen 7 mm (0.27 in) LMGs, and another five armed with 13.2 mm (0.52 in) Breda HMGs. These were all replaced during the war with American M5 light tanks. The Brazilian version was called “CV-33/II”, as the second version of the original CV-33. The CV-35s exported to Brazil were probably called CV-33/I. L3/38 of the so-called “Repubblica Soziale Italiana” (Fascist “Republic of Salo”), LXXXXVII “Liguria” Army (Graziani), September 1944. This vehicle was in the Gothic line tactical reserve, facing French forces. This model was also used by the Wehrmacht. L3/38R (radio version) used as a command tank, “Friuli” division based in Corsica, November 1942 (General Umberto Mondino). Four Italian divisions were committed to the occupation of Corsica after the German invasion of the French Vichy so-called “free zone”. This was a strategical response to the Allied landings in North Africa (operation Torch). Beute L3/38 of a Gebirgsjager unit, Albania, 1944. Carro Veloce L3/38 in German service, Rome, 1944.